Just time to put up one last post before heading off to catch my plane to Minnesota. The Mysterious Chinese Woman and I decided to have our last meal in New York before departing at my old favorite, Peter's Waterfront Ale House. 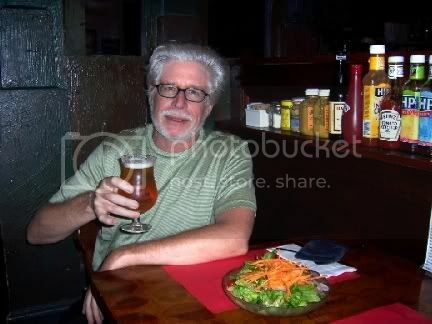 And, of course, I had a couple of beers to wash down that meal. As I may have said, Peter's does have a mighty fine selection that they change fairly often so you can always find something new. I started out with the Popering Hommel Ale to go with my salad. The Popering Hommel Ale is a Belgian Ale and is reasonably strong at 7.5%. It has a nice flowery, fresh hops nose to it and the hops do come through in the flavor; kind of subtle though. Certainly not like the hopped up IPAs that are out there now, although I like those too. This one has a nice maltiness to it and a bit of spiciness as well, pepper mostly. Quite good and certainly one to keep an eye out for. I decided to go for something a bit meatier to go with my ribs and the Oskar Blues Ten FIDY Imperial Stout certainly filled the bill. I don't know how Peter's found this one, it is brewed by Oskar Blues Grill and Brew in Lyons, Colorado. They brew a number of beers and one day maybe I will take a trip to Lyons to try a few more because the Imperial Stout was unusually good. It is a seasonal beer and not available in bottles though so it might be hard to find. It certainly stood up to the ribs though. Flavor it had in spades. Coffee came through heavily but you could also pick up hints of chocolate and malt. It is a bit thicker than your average stout as well. I doubt if you could dump down too many of these and at about 9.5% alcohol you probably wouldn't want to either. However, I would certainly go back and have it again. They will probably be out by the time I get back from Minnesota though. If you have this beer with a ribs like I did or with a good piece of flavorful meat like a rib-eye you won't be disappointed. It is beers like these that could give wine a run for its money in restaurants. 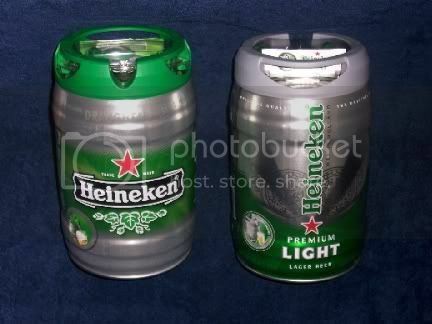 Quite frankly, I would much rather have this beer instead of the traditional red with a lot of manly meaty dishes. And, might I add, the ribs were flavorful indeed. The Mysterious Chinese Woman and I started out with smoked chicken wings for an appetizer. They were excellent. 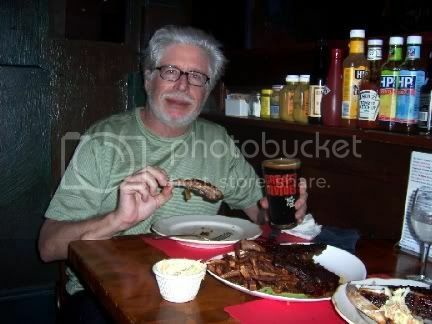 Then we split a single order of ribs. There were enough ribs left over to take with us to eat on the plane. Let the peasants have their banana and yogurt or whatever they get served, we shall eat like royalty. A few posts back I said I would tell you about the Brasserie des Rocs Triple Imperiale that I had at a family get-together. And now I shall. In New Jersey they have a bit more civilized approach to selling alcoholic beverages than they do in New York. In New York you buy your liquor in a liquor store. Liquor and wine and nothing else. No mixes, no beer, no snacks, no nothing. 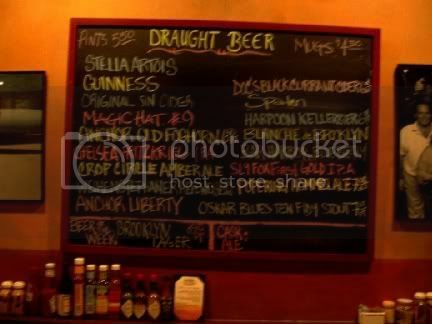 For beer you go to either a Deli, some of which have very good, if not huge, selections or you go to a beer distributor. In New Jersey the stores can sell everything, liquor, wine, beer, mixes, snacks, a bottle opener, you name it. As a result you can do one stop shopping and any decent liquor store will have a very large selection of beers. I picked up my Brasserie de Rocs Triple Imperiale at a one of these when buying the supplies needed to whip up a batch of chocolate martinis. Now, don't get on my case, my sister-in-law really likes them and I kind of like them too. I just don't think they should be called martinis. Chocolate drinkie-poos maybe. Put them in sippy-cups and give them to the kids. Makes for very mellow birthday parties. Anyway, I picked up this beer because it had a really high rating on one of those obscure scales you have never heard of before (97 rating by the Mongolian Herdsmen at the 1999 international Yak Festival). But, as it turned out, this beer deserved its accolades. 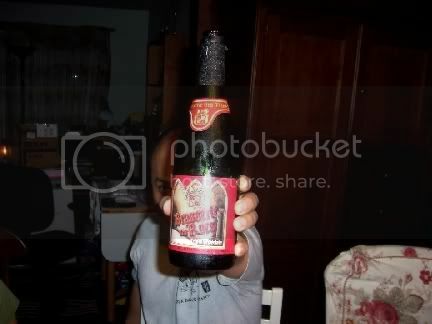 And for the observant amongst you (no religious connotation) that is indeed my brother-in-law Jim displaying the bottle. Now you would think a brewery with a name like Brasserie de Rocs that puts out a triple would be one of those old monastery based breweries that was started by Druids or something. It isn't. It was actually started in 1979. But it is located in a small Belgian village, Montignies-sur-Rocs. The brewery is also located close to the ruins of a 12th century abbey, Abbaye des Rocs, so all is good. The Triple Imeriale is a strong, 10%, triple ale, quite dark, thick, and hearty. The beer is unfiltered and the third fermentation is in the bottle. This gives it a nice creamy head and pretty good carbonation. It has a heavy, almost burnt, malt flavor that is offset with a nice spicy hops touch. It is a very drinkable beer even in the summer. I would imagine that it would be great sitting on a lake in September or October. The high alcoholic content does come through with a bit of warmth in the tummy, but it probably won't slow you down while drinking it. Whether that is good or bad depends. By the way, tomorrow I will be heading to Minnesota to spend some times with my friends up in International Falls and Ranier, both towns on the Canadian border, and my friends in Minneapolis. I may not have an opportunity to post again until I get back on the 28th so don't get concerned by my absence. Perhaps I will have some good stuff for your when I return. I think Sha Sha has re-opened so that will certainly be one place I will visit. I enjoy walking around my neighborhood, sometimes a very extended neighborhood, in the mornings. Got to stay in shape in case I decide to do something really stupid again. Yesterday I was going to head up to, well, who knows, Park Slope, Prospect Heights, Red Hook? So many neighborhood names, you never really know where you are. But please, no BoCoCa. 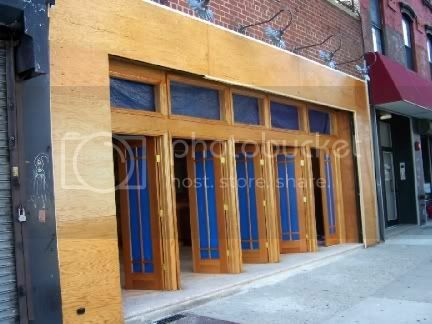 A friend said he and a partner were going to be opening a new bar on 12th Street between 4th and 5th Avenues so I thought I would take a peek. You have to admit, it is somehow quintessentially Brooklyn. Particularly with the Virgin Mary shrine perched on top. Now, coincidence number one. As I am taking a picture of Vinnie's a car stops and the guy asks me if I know how to get to 4th Avenue. I guess because I was taking pictures he thought I was a local. I asked him where on 4th Avenue he wanted to go and he said, drum roll please, 12th Street. What are the odds someone would ask me how to get exactly where I was going. And it isn't like I was going to someplace significant like Borough Hall or something. Anyway, I gave him instructions that turned out to be wrong (unless he drove the wrong way down a one-way street). After a fairly healthy hike I reached my destination and spotted what I hope was not the bar my friend was talking about, unless he was going really retro. Actually, it looked like it might get interesting late at night. I think maybe the place being built next door might have been it though. This is definitely going to be a bar because I looked inside and that was the one thing that was already in place. I think it will be a fairly nice place too. Might give Commonwealth a run for the money. 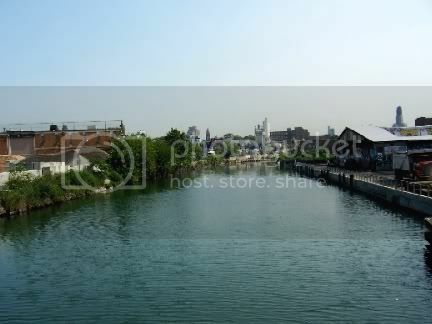 On the way home I passed over the Gowanus Canal and have to kvetch once again. In almost any other city in the world this waterway would have nice restaurants, probably a marina or two, hotels and maybe condos. 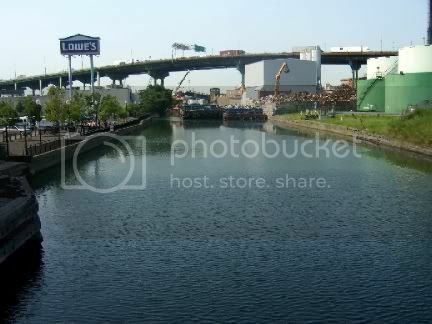 It empties into the ocean so it would be perfect for yachts and sail boats too. But, in New York it is lined with cement factories, vacant lots, and who knows what else. And after twenty years of hearing how the canal is going to be cleaned up and the surrounding land developed, it is largely unchanged. The pace of change in New York can be pathetically slow sometimes. Okay, coincidence number two. It was a pretty long walk and it was getting hot so I thought about stopping in to a Deli and buying a beer or two to have when I got home. For some reason I decided not to and patted myself on the back for showing such self-restraint. About fifteen minutes after I got home though I got a buzz from my doorman telling me to come downstairs and pick up my beer. You will never guess what was waiting for me. It even came with a nifty insulated backpack just big enough to carry one of them around. Perfect for my morning walks. It came with a card so I called the number to find out why I got it. 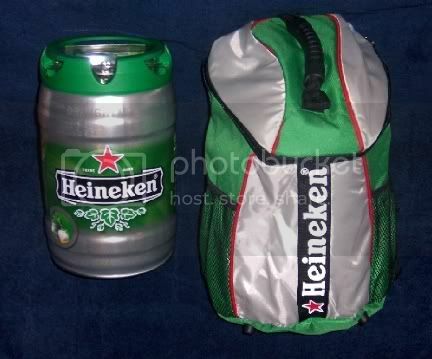 Apparently it was sent by the same guy who sent me the Heineken Light Beer when it was first being introduced, as a promotional item. I guess the fact that I also post about the stuff keeps me on his list and I am not complaining. Each of these DraughtKegs holds 5 liters and, supposedly, once you cool it for a minimum of 10 hours it will keep the beer fresh for up to 30 days. Now this seems kind of neat until you figure that once you pop a 5 liter keg, what are the odds it would last for 30 days? Still, they look like they would be nice for a picnic or a Jets tailgate party, or my morning walk. I will try one of them out at the next Jets game to see how they work and will report back. Oh yeah, I had to have the doorman explain to the Mysterious Chinese Woman that they really were free and that I hadn't ordered them. I can't understand why she didn't just trust me on this. Last night I decided to take the Mysterious Chinese Woman out for dinner tonight and we decided to try a place we have passed by many times but never stopped in. 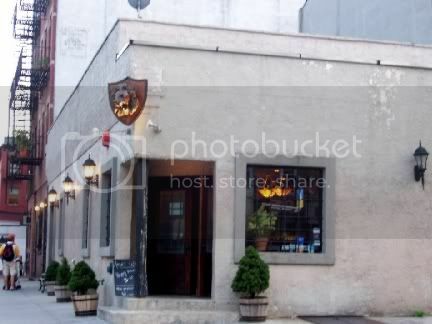 It is the Red Rose at 315 Smith Street, not far from where I live. 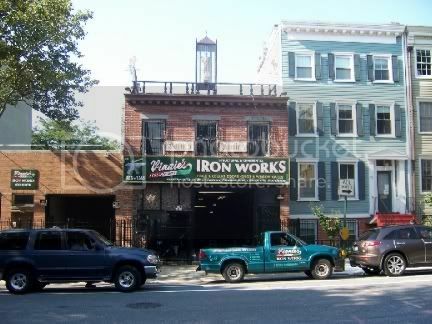 Although Smith Street now has a reputation of being the restaurant row in Brooklyn, most of the restaurants are relatively new. 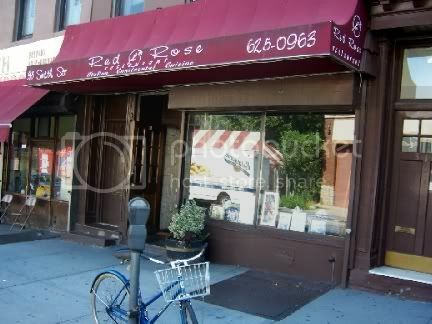 Not Red Rose though, it has been in its current location for almost 25 years and is family owned. It is further south on Smith Street than many of the newer restaurants, more in the older brownstone Italian section, and it suits the neighborhood well. 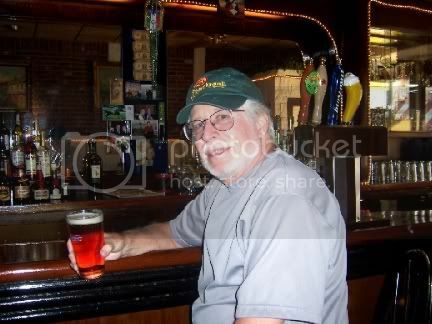 Son Santo now manages the place and acts as host, bartender, and generally nice guy. His parents were sitting at a front table keeping an eye on things and enjoying a dinner of their own with a friend. I decided to have a beer at the bar and catch the end of "The Shining" which was playing on the television above the bar. They don't have a real big selection of beers but they did have Sierra Nevada, a great all-around thirst-quenching beer that I will never refuse. It has a nice amber coloring and is fairly full-bodied for its style. Decently hoppy with a nice nose to it. The decor and the food here is old-style southern Italian style, and the portions are generous indeed. 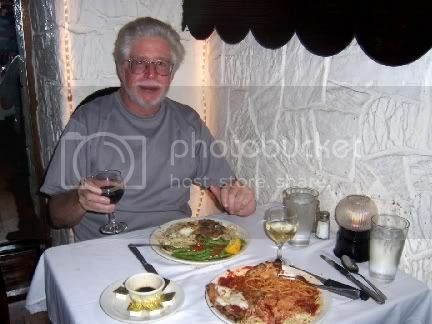 I ordered the Grouper but was told they were out and suggested the Tilapia instead. It was very good indeed. To their credit, they didn't try to palm the Tilapia off as Grouper, something that I have seen in less reputable places. The Mysterious Chinese Woman ordered the Veal Scallopini and she said it was very good as well. You certainly got generous portions so I will probably have the rest of her meal for lunch tomorrow. 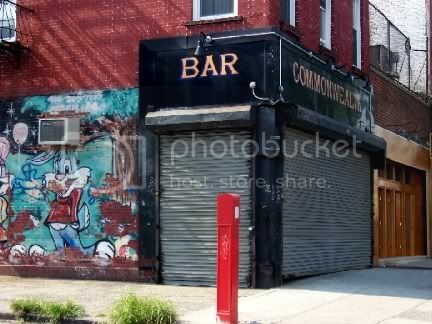 I would certainly recommend this place if you want a taste of the old Brooklyn. Bring your appetite though and be prepared to have a good time. On the way home I passed by Angry Wade's and had a free drink token that was burning a hole in my pocket. Coincidently, Wade was in there having a beer and he joined me while I had mine. 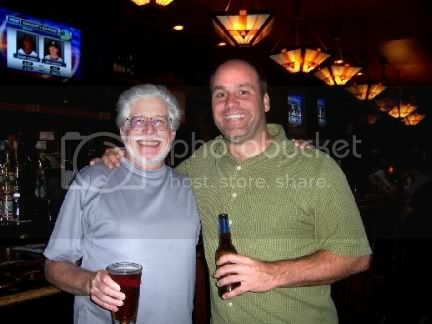 For those of you who don't know the story, Wade presented me with tokens for 100 beers upon my completing my 1000 bar trek in 2005. I am slowly working my way through them. 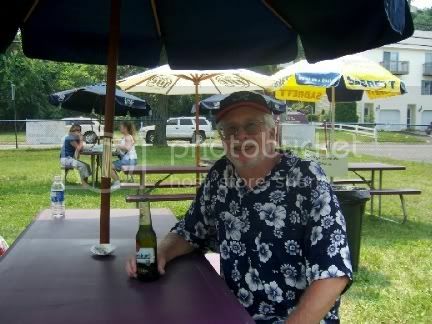 I had a Blue Point Toasted Lager, made locally on Long Island. Another good all-around beer that is both thirst-quenching and flavorful. It had been perfectly poured by Vanessa, the busy and beautiful bartender. Another nice night with a bunch of nice people here in Downtown Brooklyn. Now these guys know how to put together a pub crawl. I am truly envious. One of these days I am going to join them. When I do I will be sure to let you know about it. Maybe next year. Well, it really wasn't a road trip, exactly. Actually took a ferry from downtown Manhattan to The Heights in New Jersey for a family get-together. Our first stop though was a Clam Festival. Always a good time with really good clams with garlic in a butter sauce. 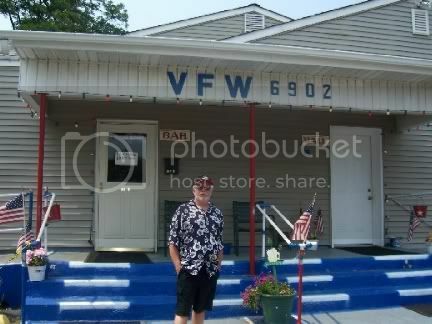 After eating my fill I headed to the nearby VFW for a cold one. Those of you who regularly read my blog will remember that I have been here before. Last time I had a few beers inside but today I decided to try out their beer garden. Normally I don't expect much in the way of variety at a VFW Club. No offense, the prices can't be beat but Budweiser and Coors are usually as exotic as they get. They did have a lot of Corona though. They said one of their members actually bought it in Mexico and drove it back so they got a good price on it. The stand-out, however, and quite unexpected, was Pilsner Urquell. Now Pilsner Urquell is a might fine beer indeed. Many will insist it is the best Pilsner beer in the world. Many people aren't sure just what a Pilsner beer is. Well, you can always count on The Bar Man to set the record straight. Well, not always. Sometimes I just make things up. The term Pilsner has become a bit generic in that it is often used to refer to almost any lager. Lagers are a bottom fermented beer that is aged at cool temperatures. Most non-ales tend to be lagers. Ales, are top fermented and are often aged at warmer temperatures. A lot of beer terminology is used a bit loosely, even among professionals. People often associate pilsners with a lager that is a bit more carbonated than usual and perhaps a bit hoppier as well. Strictly speaking, however, a Pilsner is a beer that comes from the Czech town of Pilsen. Think of it like Champagne. Many people call any white sparkling wine Champagne, but strictly speaking it can only come from the Champagne region of France. Pilsners are the Champagnes of lager, metaphorically speaking. At any rate, in Czech Pilsner Urquell is called Plzensky Prazdroj. However, at the time it was created by Josef Groll in 1842, the town of Pilsen was part of the Austrian Empire and the official language was German. Pilsner Urguell translates, roughly, to "Pilsner from the original source." Well, no matter, just let me say that Pilsner Urquell is a mighty fine beer of its style. If not the best, than certainly right up there. 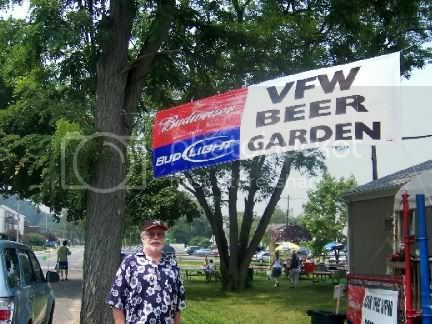 And on a hot day in a VFW Beer Garden, it was most welcome indeed. It is a very crisp refreshing beer that is a bit dry but with a bit of a floral nose and a spicy hoppiness to it. The after taste is dry with a touch of bitterness. But I mean that in a good way. 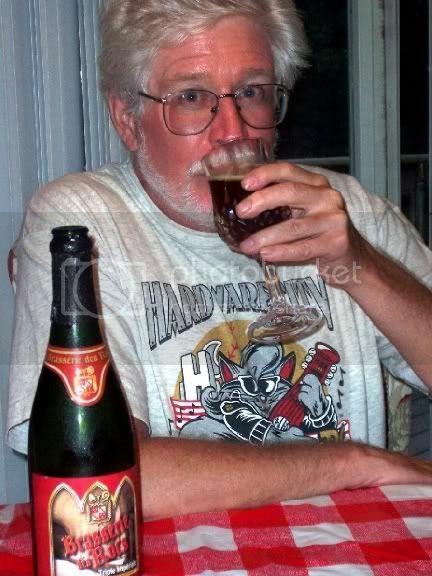 Later, at aforementioned family get-together, I had an interesting Belgian Ale, Brasserie Des Rocs Triple Imperiale. More on that next time though.